Finest American Plains Buffalo Meat! Above items all raised with NO hormones, and NO antibiotics. Click here for more info on how we raise our Bison. 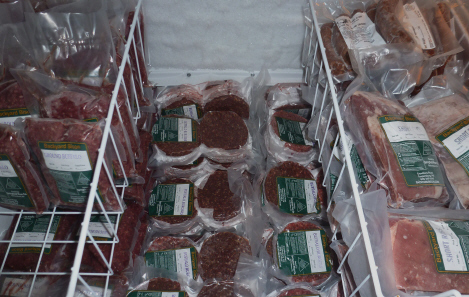 Items are vacuum-packed and flash-frozen for quality. Discounts - Everyone gets the discount price from us - We offer a very high quality product and our prices are lower than the commercially produced and processed Bison in our local Giant (grocery store), so we are not able to offer any further discounts or wholesale pricing. We do NOT accept credit or debit cards - I do not want to raise our prices to cover the card processing fees, especially since that would raise the price without improving the quality of the meat. We do not ship or deliver - Sorry, but with our current farmers market schedule and farming duties, we just do not have time to pack, ship, or deliver orders. We do not sell clothing with our logo or farm advertising. We are not like Wal-Mart. Okay, so it may seem strange for me to list these things that we do not do, but operating a farm/ranch like this, is not like a normal business. I earn a living doing something that very few have been able to do (because I do not do things like everyone else). My days are very long, and there are few holidays, sick days, or vacations, so I need to keep it simple, so that I can focus on the important things like the quality of the meat that we produce.